by John Sabol and Lisa Alzo. Cleveland’s Slovaks can best be characterized as survivors. Many survived ethnic persecution and poverty so they could have a chance at something better. 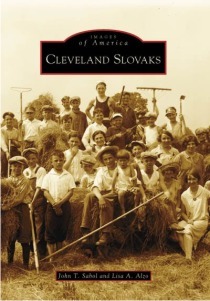 Beginning with a small core of immigrants seeking work aboveground rather than in the coal mines of neighboring states, Cleveland’s Slovak community grew through a giant chain migration. Their neighborhoods flourished close to their jobs and their churches. Many of the ancestors of today’s Slovaks came to the United States classified as Hungarians. In their hearts, though, they knew what they were and what language they spoke. They held on to their native language even as they learned English and unwaveringly encouraged their children to strive for the opportunity America offered. According to the 2000 census, 93,500 northeast Ohioans claim Slovak heritage. The photographs in Cleveland Slovaks show their neighborhoods and family life and give readers an appreciation of the community’s legacy.